One of the best things about horses is that when they love you, they let you know it. There’s no sight that quite matches the way your horse’s ears swivel forward when they hear your voice or the happy prance around the corral that comes when they know it’s time for a ride. Horses are very affectionate, and it’s a beautiful thing. 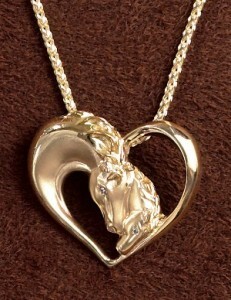 Treat the horsewoman in your life to your own form of beautiful affection with romantic gold horse jewelry. 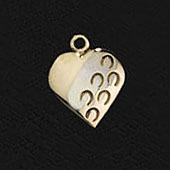 This morning, we’re loving the 14K Gold Hoofprints on Your Heart Charm. Check out the six sweet little hoofprints angled over the surface! Slightly larger than a half-inch square, this gold heart charm works well as a pendant or as a special addition to a charm bracelet. It’s a lovely gift – perfect for a birthday, anniversary, or Valentine’s Day. Another great piece of romantic horse jewelry is this 14K Gold Mare & Foal pendant. We have to tell you, the pictures of this piece just don’t do it justice. When you see the detailed faces of the mare and her foal, snuggling in a precious moment, diamond eyes shining, it’s enough to take your breath away. The heart shape is of course the enduring symbol of love. The open, airy design is very in at the moment, while the unique presentation highlights your distinctive style. Made in the USA of fine 14K gold, the Gold Mare and Foal pendant is a piece of jewelry that will take the place of honor in any collection. It’s a very romantic gift, one that she’ll love wearing for years to come! We can learn a lot about love from our horses. First of all, if someone always has sugar cubes in their pocket, they’re probably good news! Second, there’s nothing wrong with letting the people you love know how you feel. 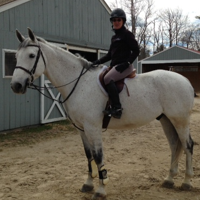 Don’t miss a chance to let the horsewoman in your life know how special she is to you.